Nalhati, Birbhum DistrictNalhati is a town situated in Birbhum district of West Bengal. The name of the town was derived from the Shakti peetha Nalhateshwari temple. Mythologies say that the temple is located at the place where throat of Goddess Shakti, `nala`, had fallen. Nalhati is also a junction railway station where old Sahibganj Loop of the Eastern Railway joins the Azimganj line. The establishment of Nalhati municipality was done in the year 2000. 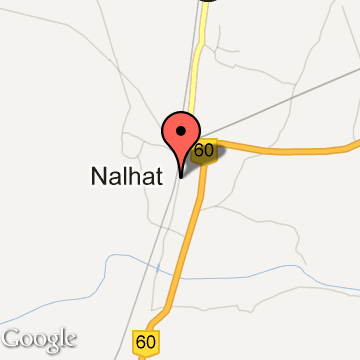 Nalhati is located at an elevation of 48 metres on the Choto nagpur plateau. It houses a small hill of quite low altitude. The town houses red soil. The major tourist interests in the town are Ana Baba Mazar Sherif and Nalateswari temple. The town has a healthy and pollution free environment. Near the town Chandramani hills near Bautia and Baidhara Shalbon at the Brahmani river delta are other inviting tourist places. Nalhati also serves as the source of stone chips of good quality for Southern Bengal which houses a crusher belt near the town. Nalhati is a town, municipality in Birbhum District in the Indian state of West Bengal near the West Bengal / Jharkhand border. This town is named after the Shakti peetha Nalhateshwari temple, which according to the mythologies is the situated where the "nala" i.e. throat of goddess Shakti had fallen. It is one of the 51 Shakti Peethas in India. Nalhati Tourism - Get all information on Nalhati tourist places and sightseeing tours. Our website helps you plan your next tour and gives you great ideas on what to do, where to eat, where to stay and when to go there. We give the best information from the web to give you precise, meaningful and useful travel guide for leading places to visit in India and from across the world. Our travel information on NALHATI tourist places, tourist attractions, major sightseeing, the best time to visit, the top places to visit in Nalhati, the must-see things to see and do, maps, restaurants, hotels, nearby tourist destinations, local public information and more. To start with check out information on how to reach Nalhati.